This piece is done exclusively using my imagination, and based on a sketch I did more than 5 years ago in China. 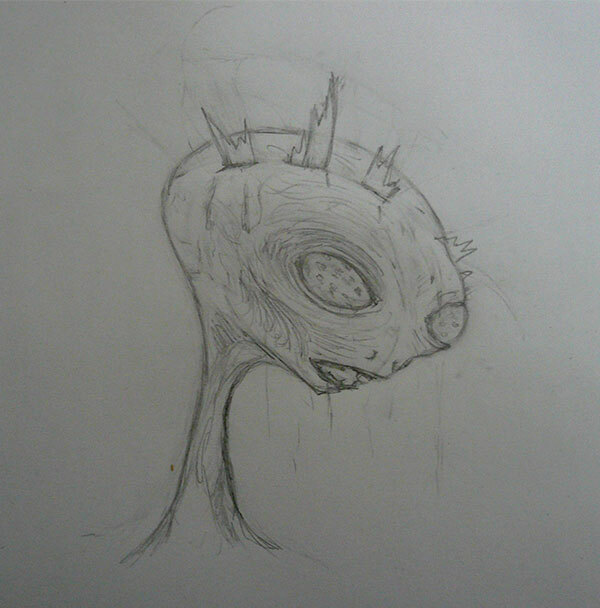 Original alien pencil sketch done in China over 5 years ago. I bring this up because there’s a certain spectrum of people, including artists, who dismiss anything I do with a computer as somehow not real art, or as mere “graphic art”, because it wasn’t done by hand (even though it was done with a tablet and stylus pen). I can see where they’re coming from because I might fold my arms while looking at a wonderfully elaborate fractal image because I know all the rendering is done by the computer. It still takes skill to manipulate the program, but, what impresses me is the fabulous detail, which owes more to the programming than to the end user. No, the computer doesn’t draw or paint anything for me. I think it’s pretty obvious this is traditional art, with a capital “T”, in which case it is dismissed by the “radical” conceptual artists on the other end of the spectrum as well. I’m a little worried people might think that this image mocks their religion. It doesn’t, and it should be apparent that it’s not meant to be funny at all. It’s tragic, and painful. The most obvious reference is to the “crown of thorns”, but more in league with artistic depictions than directly with religion. Significantly, however, and sadly, people have and continue to be crucified, tortured, and executed in all manners, and under all pretexts. Whether it’s bombs, beheadings, shootings, drone strikes, stoning to death, or pushing people off of buildings – all of which have been in the news in the last month – people continue to inflict the worst imaginable suffering on one another. Shifting a painful form of torture associated with humans onto an alien suggests some interesting social and philosophical interpretations and questions. Was this done by humans or other aliens? Are presumed advanced civilizations capable of the basest barbarity? Do aliens have a parallel development in which they have their own religions and martyrs? Is it possible that humans and aliens have the same God? Are aliens torturing each other over superstition and narrow belief systems? There’s a lot of ambivalence built into the image. It’s not clear whether the glass-like shards were forced into the alien’s head, or erupted from it. Can its eyes see, or not? Is it dead, dying, alive, or surviving? Is the blood in its mouth its own, or did it kill something with its sharp teeth? Has it been punished for doing something terrible, or for being good in the face of the terrible? Are those mountains in the background, or are they temples? Is it mortal or divine? It’s about all those things, and other subtle stuff like alienation, punishment, banishment, death, and consciousness. But some of my favorite stuff, as an artist’s artist, is just things like the pieces of glass, the light coming through them, and the shadows they cast. You don’t need to know any of the background to this piece, though, or even speak English, to appreciate it. I think anyone in the world might have a reaction to it. I wanted to make a dramatic image without too much distracting going on in it, and which would be difficult to ignore. It’s an alien, but it’s about humanity. It’s sci-fi art, but also fine art. And for my eye, it’s beautiful. High quality prints are available. 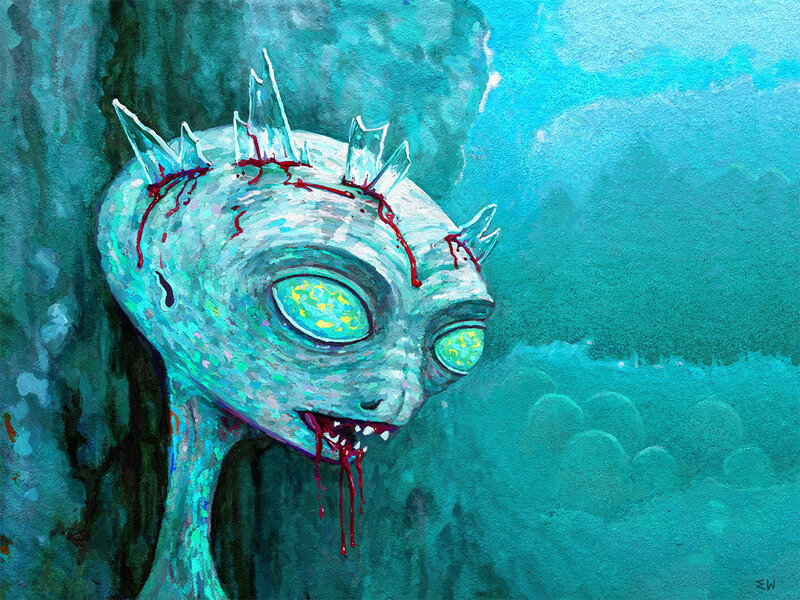 Posted in artTagged alien, art, contemporary art, digital art, horor, painting, sci-fi, science fiction art, tortureBookmark the permalink. Scary! Now I’m gonna have nightmares. I love all the questions that you posed and I tweeted your quote, “It’s an alien, but it’s about humanity.” becuase I think that encapsulates what this image means to you which is rather powerful. He could be hell bent on revenge, like the Iron Man in the Sabbath song.